^ a b Uzbekistan will publish its own book of records Ferghana.ru. 18 July 2007. Retrieved July 29, 2009. ^ a b Climate, Uzbekistan : Country Studies- Federal Research Division, Library of Congress. ^ OMCT and Legal Aid Society, Denial of justice in Uzbekistan– an assessment of the human rights situation and national system of protection of fundamental rights, April 2005. ^ Wan, Guanghua; Sebastian-Samaniego, Iva (2011-08). “Poverty in Asia and the Pacific: An Update(アジア・大洋州地域の貧困：アップデータ)” (英語) (PDF). Economics Working Papers (アジア開発銀行) WPS113836: 10ページ. ISSN 1655-5252. https://www.adb.org/publications/poverty-asia-and-pacific-update 2019年3月24日閲覧。. ^ 世界銀行 (2019-02-07). ﻿World Development Indicators database, World Bank, 1 July 2018＞Gross national income per capita 2017, Atlas method and PPP（世界開発指標データベース、世界銀行（2018年7月1日）＞一人当たりの国民総所得2017、為替レートの換算法およびPPP）﻿ (Report). https://datacatalog.worldbank.org/dataset/gni-capita-ranking-atlas-method-and-ppp-based 2019年3月24日閲覧。. ^ 下社 学 (2018-04-09). ﻿HP>海外ビジネス情報>地域・分析レポート>新体制下で改革進むウズベキスタン﻿ (Report). 独立行政法人日本貿易振興機構. https://www.jetro.go.jp/biz/areareports/2018/a813a0ace11f15fc.html 2019年3月24日閲覧。. ^ a b c (PDF) ﻿世界の鉱業の趨勢2018 ウズベキスタン﻿ (Report). 独立行政法人石油天然ガス・金属鉱物資源機構（JOGMEC）. (2018-12-26). http://mric.jogmec.go.jp/wp-content/uploads/2018/12/trend2018_uz.pdf 2019年3月24日閲覧。. ^ Islam Karimov's interview to Rossijskaya Gazeta, 1995-07-07 Principles of Our Reform (ロシア語). ^ a b Cornell, Svante E. (2000). 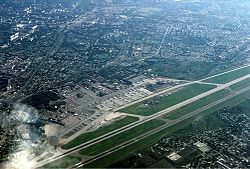 “Uzbekistan: A Regional Player in Eurasian Geopolitics?”. European Security 9 (2): 115. doi:10.1080/09662830008407454. オリジナルの2009-05-05時点によるアーカイブ。. http://web.archive.org/web/20090505153156/http://www.cornellcaspian.com/pub/0010uzbekistan.htm. ^ a b c Richard Foltz (1996). “The Tajiks of Uzbekistan”. 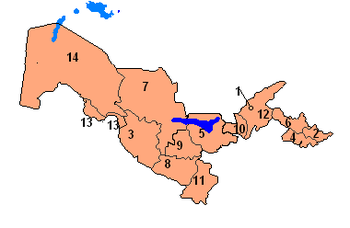 Central Asian Survey 15 (2): 213–216. doi:10.1080/02634939608400946. ^ a b Karl Cordell, "Ethnicity and Democratisation in the New Europe", Routledge, 1998. p. 201: "Consequently, the number of citizens who regard themselves as Tajiks is difficult to determine. Tajikis within and outside of the republic, Samarkand State University (SamGU) academic and international commentators suggest that there may be between six and seven million Tajiks in Uzbekistan, constituting 30% of the republic's 22 million population, rather than the official figure of 4.7%(Foltz 1996;213; Carlisle 1995:88). ^ Lena Jonson (1976) "Tajikistan in the New Central Asia", I.B.Tauris, p. 108: "According to official Uzbek statistics there are slightly over 1 million Tajiks in Uzbekistan or about 3% of the population. The unofficial figure is over 6 million Tajiks. They are concentrated in the Sukhandarya, Samarqand and Bukhara regions." ^ Tatjana Zerjal; Wells, R. Spencer; Yuldasheva, Nadira; Ruzibakiev, Ruslan; Tyler-Smith, Chris (2002). “A Genetic Landscape Reshaped by Recent Events: Y-Chromosomal Insights into Central Asia”. The American Journal of Human Genetics 71 (3): 466–482. doi:10.1086/342096. PMC: 419996. PMID 12145751. https://www.ncbi.nlm.nih.gov/pmc/articles/PMC419996/. ^ World Jewish Population 2001, American Jewish Yearbook, vol. 101 (2001), p. 561. ^ World Jewish Population 2007, American Jewish Yearbook, vol. 107 (2007), p. 592. ^ "The Russian Minority in Central Asia: Migration, Politics, and Language" (PDF). Woodrow Wilson International Center for Scholars. ^ The Russians are Still Leaving Uzbekistan For Kazakhstan Now. Journal of Turkish Weekly. December 16, 2004. ^ Deported Nationalities. World Directory of Minorities. ^ Crimean Tatars Divide Ukraine and Russia. The Jamestown Foundation. June 24, 2009. ^ Greece overcomes its ancient history, finally. The Independent. July 6, 2004. ^ World Directory of Minorities and Indigenous Peoples – Uzbekistan : Meskhetian Turks. Minority Rights Group International. ^ Richard Foltz, "The Tajiks of Uzbekistan", Central Asian Survey, 213-216 (1996). ^ SamAuto supplies 100 buses to Samarkand firms, UZDaily.com. Japanese firm buys 8% shares in SamAuto, UZDaily.com. ^ First high-speed electricity train carries out first trip from Samarkand and Tashkent, 27 August 2011. Uzdaily (2011-08-27). Retrieved on 2012-02-19. ^ Lena Jonson, "Tajikistan in the New Central Asia", Published by I.B.Tauris, 2006. p. 108: "According to official Uzbek statistics there are slightly over 1 million Tajiks in Uzbekistan or about 4% of the population. The unofficial figure is over 6 million Tajiks. They are concentrated in the Sukhandarya, Samarqand and Bukhara regions." 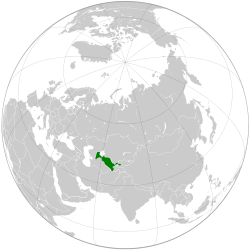 "Uzbekistan". The World Factbook. Central Intelligence Agency.